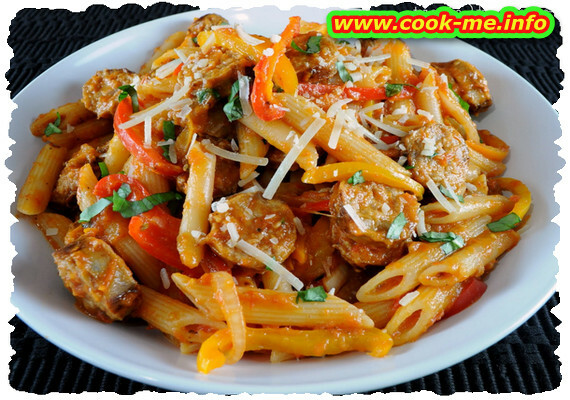 Delicious italian pasta recipe , best served sprinkled with basil. Reduced complexity , 35-40 minutes cooking time. Finely chop the onion and cook it in a pan with a little oil and a little butter, add the pancetta and let it cook a little longer. Cut the frankfurters in small cubes and put them in the pan over the onion and pancetta, after put the tomato sauce and 2 tablespoons of milk and some pepper. We didn't use salt because the pancetta is already salted. All has to simmer about 20 minutes. Meanwhile cut the smoked cheese. We used soft cheese ( scamorza affumicata for who knows ). Boil the pasta in water , with salt to be firm but not hard. When the sauce is done add the pasta over, the cheese and mix. SERVING: With basil leaves sprinkled on top.